Genetic testing is done before a pregnancy, during a pregnancy, or later in life, as a way to detect whether a person’s genes or chromosomes may be linked to a health condition. 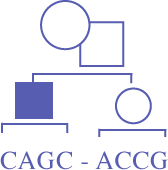 For more detailed information please see the pamphlet ‘Reproductive genetic testing and screening options’ viewable on CAGC and AHRC Web sites. The results of a genetic test can have a major impact on the lives of people who have the tests and their families. how to deal with the results of testing. What aspects of genetic testing are unique to preimplantation genetic diagnosis (PGD)? Planning a pregnancy can create a great deal of anxiety for an individual, couple or family when there is a concern about a genetic condition that can be passed on to children. PGD is intended for detection of specific genetic conditions, but testing may reveal an unexpected chromosome problem in the embryo, unrelated to family history. The risk of passing on a genetic condition may be as high as 50%. However, a situation can happen where, by chance, ALL of the embryos carry the genetic condition. PGD does not guarantee that an embryo will implant or that a full term pregnancy will result. Miscarriage can still occur. If PGD testing shows embryos carry a genetic condition, those embryos are not usually transferred. If there are embryos remaining after PGD testing that will not be used, genetic counsellors can help educate clients about their options. What are some common feelings associated with genetic testing in a variety of circumstances? Some individuals, couples and families who have genetic testing may worry about what the test result may show, or how they will react to the test result. Others may feel relief that they were able to inform themselves. The results of genetic testing may help people to decide what to do next. Not everyone that has a genetic test will have the same reaction. Individuals within a family may have very different feelings. Some who are at risk of having a child with a genetic condition may feel anxious or overwhelmed at the thought of passing it onto the next generation. Others may be comfortable with the risks but wish to learn about their options. People undergoing fertility treatment or PGD may experience stress resulting from uncertainty about the procedures, the decisions that they may face, the future health of their potential child, financial strain and relationship pressures. Counselling is often available to provide assistance in coping with these stressors. What are some common challenges of genetic testing? Results of the testing are not always clear. Some genetic conditions show incomplete penetrance, meaning that symptoms of the disorder may never appear, even though the gene is altered. A normal result does not guarantee that a child will be healthy. Routine genetic testing does not test for all possible conditions. Genetic test results do not predict when symptoms will begin or how severe a disorder may be. Certain genetic conditions show variable expression. This means that even people in the same family with the same condition may be affected in different ways. Such challenges can be confusing, and increase stress. Genetic counsellors provide confidential, short-term counselling that respects personal decisions. Genetic counsellors often work in Health Centres and Genetic Centres as part of a team that includes physician clinical geneticists and laboratory geneticists. Genetic counsellors cannot eliminate the stresses linked to genetic testing. However, counsellors may help by suggesting ways to manage stress. Genetic counsellors offer a safe, supportive, confidential environment in which to share personal and family medical history, and to explore the emotional aspects of both genetic testing and the results of tests. prepare to deal with a result that was not expected, or not desired. What happens when short term genetic counselling ends? Genetic counsellors provide short-term counselling, but may suggest a referral for longer-term counselling or medical advice.